The best cookie presses can make baking cookies, snacks, cakes, and pastries stress-free and easy all year round! We found 10 great cookie presses that make beautiful holiday spritz cookies, savory crackers, cheese straws, churros, stuffed pastries, and a whole lot more. The sky’s the limit to what you can do with this versatile kitchen tool! Before we dive into the reviews, here are some features you should know about to help you choose the right press for you. # of Discs: Each cookie press comes with discs that allow you to make a variety of shapes, like trees, flowers, animals, and more! We’ll let you know how many discs come in each set, so you can get the ones you want! 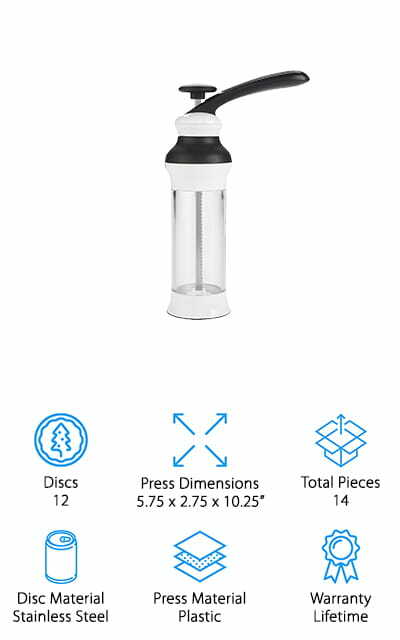 Press Dimensions: We’ll let you know the size of each cookie press, so you can buy one you feel the most comfortable using. Larger ones are great for making large cookies, while smaller ones are great for easy storing in small kitchens! Total Pieces: In addition to the decorative discs, many of the cookie presses we reviewed come with other fun accessories you can use for baking! Many of them come with extra frosting tips, cleaning tools, and storage containers to keep everything organized! Disc Material: The discs that come with cookie presses can be made from either plastic or metal. Stainless steels or aluminum discs will make sharp and crisp shapes, while plastic discs will never rust and are incredibly easy to clean between uses. Press Material: We’ll also tell you what the cookie press is made of, so you can choose the best option for you! We found heavy-duty stainless steel presses, and there are see-through plastic ones to gauge how much batter you’ve already used! Warranty: A warranty is a great sign that the company stands by their product, and they’ll do the right thing if your cookie press arrives broken, malfunctions over time, or you need to replace discs if they bend, break, or rust. Now that you have a good idea of what you’ll need, let’s find the best cookie press for you! We did the research for you and found 10 great cookie presses that create beautiful cookies with just the light squeeze of a handle! They are great kids and make great gifts for loved ones! If you’re pressed for time (pun intended), no worries! Check out the Top Pick and Budget Pick first, and then come back to read the rest! First up is our Top Pick for the best cookie press – the Atlas Cookie Press from Marcato! This press has everything you need to make beautiful cookies that will impress your family year-round. The steel and aluminum press is easy to fill and presses consistent amounts of dough each time, allowing you to make dozens of tasty treats without making a mess! It’s also incredibly easy to take apart and clean afterward, so you can store it away for next time without worrying about rust or bacteria building up between uses. 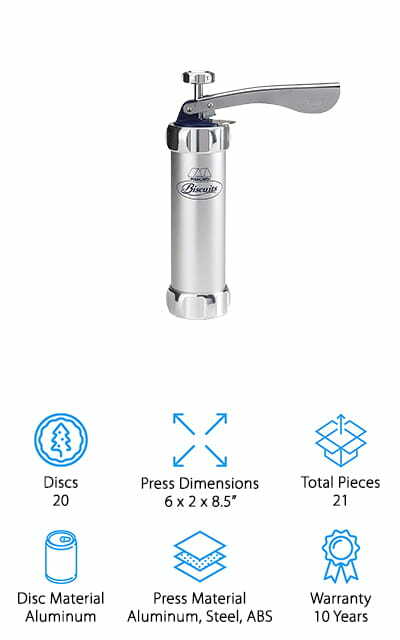 We like that it comes with 20 aluminum discs in classic shapes you can use to make trees, hearts, wreaths, shells, butterflies, and more. You can also set the cookie press to make either small or large cookies, so you’re getting up to 40 different types of cookies from one kit! With a 10-year warranty, you can feel great about investing in this kit, knowing it’s built to last. Whether you’re new to baking or a gift for a young baker in your family, the Good Grips Cookie Press from OXO is a great press that won’t cost a lot! Our Budget Pick is the best cookie press on the market for bakers on a budget because it’s easy to load and use. It also has a clear canister so you can see when it’s time to refill with more batter and makes it easier to get clean. 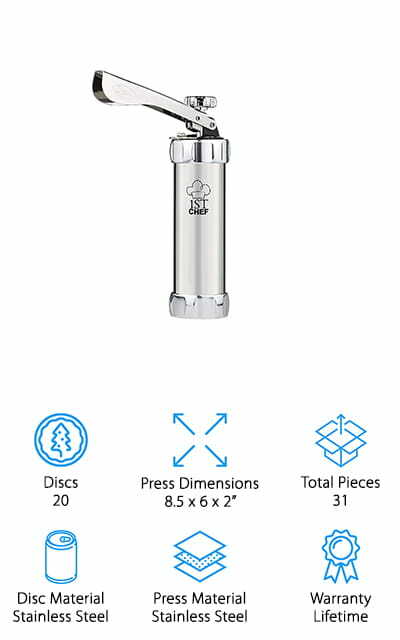 The kit comes with 12 stainless steel discs in a variety of fun shapes like trees, flowers, fleur de lis, leaves, and even a bear! The discs come in a plastic storage case, which keeps them well protected and sharp. If you want even more disc options, they also sell kits with season-specific discs for the holidays, autumn, or springtime! 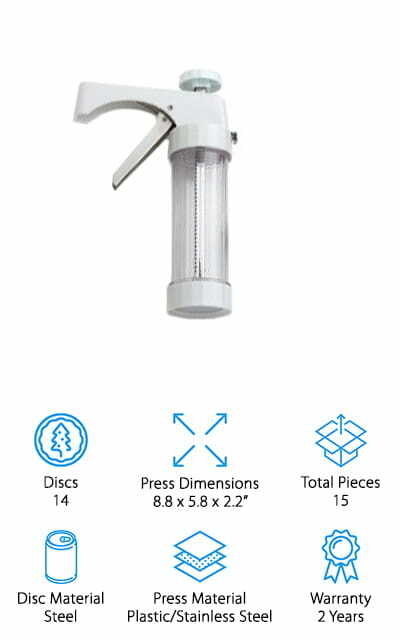 We think this is one of the best cheap cookie presses that any young baker would enjoy using in their kitchen! 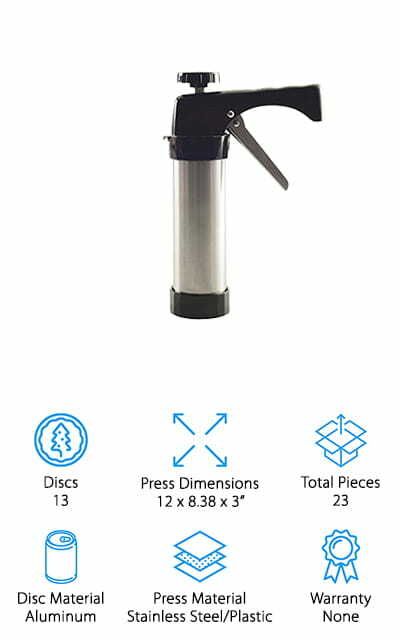 If you’re wondering what is the best cookie press to buy to do more than just cookies, consider picking up this kit from 1st Chef! We like this kit because it comes with 31 pieces to make all of your holiday baking a piece of cake! The stainless steel press is easy to use, and it’s a favorite among professional bakers because it’s so durable. 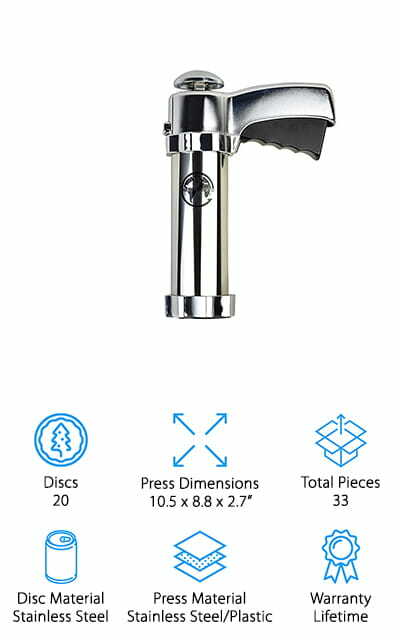 The kit comes with 20 stainless steel discs that can create a variety of fun shapes for your spritz cookies, and smaller discs to make churros or cheese straws! It also comes with 8 piping tips and a reusable piping bag, so you can decorate your cookies, cakes, cupcakes, and more! To spark your creativity, it also comes with a free e-book you can download for recipe ideas to use your press all year long! We think this kit would make a great gift for someone who wants an all-inclusive kit to get them started! Another great kit you can get that tackles a lot of your baking tasks is this one from Earth’s Dreams! 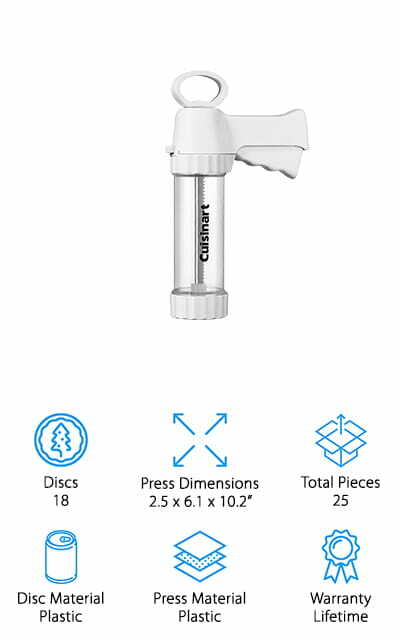 We like this cookie press because it has an ergonomic handle that makes it easy to use, even if you have trouble gripping cooking tools. Even kids will enjoy using it! The kit comes with 20 discs that make a variety of fun cookie shapes, like trees, flowers, rounds, and more. There are also 8 frosting decoration tips you can use to decorate your cookies or use them to create flowers and pretty borders on cakes, cupcakes, and more. You can even use them to stuff fillings into desserts like cannoli or churros! We also like that this press is easy to clean, thanks to the cleaning kit that’s included! This is a great kit if you’re looking for a sturdy, easy to use press that can make cookies, pastries, and cakes look like you bought them at a bakery! This cookie press kit from Super Kitchen has everything you need to get all of your holiday baking done quickly and without stress! 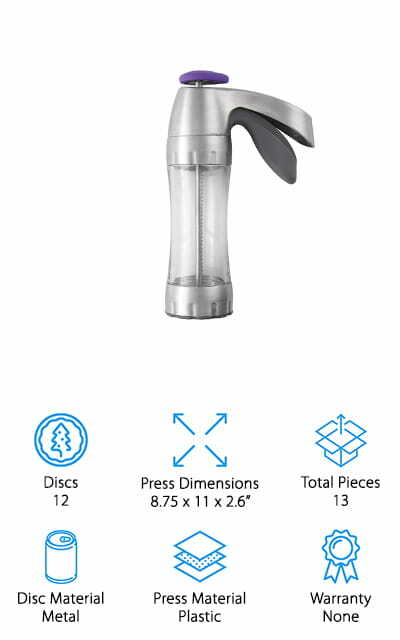 The cookie press is made of stainless steel and plastic, and it’s easy to take apart and clean between uses. We like that the handle is easy to operate with one hand, and it creates consistent cookies each time. This kit comes with 13 aluminum discs to create a bunch of fun shapes you can turn into decorated cookies, sandwich cookies, and more. It also has 8 frosting piping tips you can use to decorate your spritz cookies or use it for filling pastries and decorating cakes! You can also use the piping tips to pipe out dough to make éclairs, churros, cheese straws, ladyfingers, and more! The possibilities are nearly endless with this kit! It’s all housed in a nice plastic case that keeps all of the discs and piping tips neatly organized and damage free! A great gift idea for the baking enthusiasts in your family would be this inexpensive cookie press kit from Wilton! We like that this press has a plastic barrel, so you can see that it’s clean and ready to use – especially if you switch between different colors of dough! It’s easy to take apart and clean, too! Just hand wash and dry everything between uses to keep it clean and working beautifully. The kit comes with 12 discs that make classic cookie shapes like trees, rounds, hearts, and intricate flowers. There are also some fun ones like a turkey, snowman, and starburst to switch things up! It works well to press both sweet cookies and savory crackers, so you can make a variety of snacks everyone will enjoy all year long. Since it’s an inexpensive kit, you could easily buy a few of them for your baking group, the kids in your family – and grab one for yourself, of course! 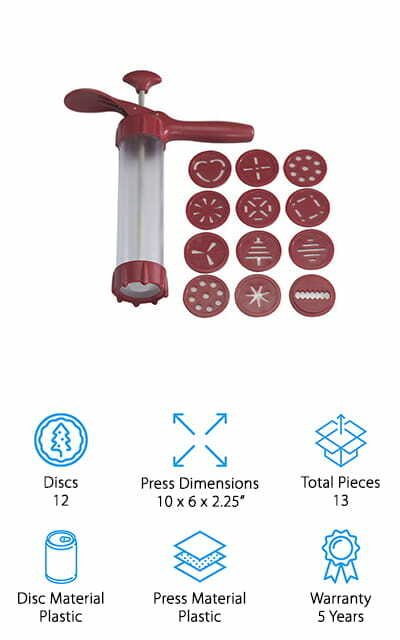 This all-plastic cookie press kit is great for introducing kids to baking! The press is dishwasher safe, and it’s also easy to hand wash if you want to switch to a different color of dough. The discs and piping tips are also dishwasher safe, as long as you have a basket to keep them safely contained while washing. It’s also nice to have the clear barrel, so you can see how much dough you’re using and when to refill! This kit comes with 18 discs, which make various shapes and even numbers! You could make numbered cookies to celebrate birthdays, your child’s sports jersey number, or top their birthday cake with them for some added fun! It also comes with piping tips you can use to make churros, cheese straws, frost cakes, and even a stuffing tip to add filling to pastries or cupcakes! This cookie press will be a lot of fun for kids to create their favorite snacks! 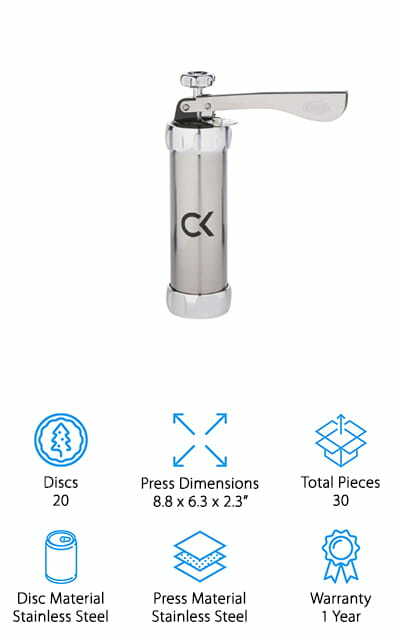 If you have a small kitchen and want one tool that does multiple tasks, pick up this cookie press from Complete Kitchen! It does more than just press cookies – it makes churros, cheese straws, and even pipes frosting! The press is made of stainless steel, and you can adjust the size/height of the cookies from small to large from the handle. It also comes apart completely to make it easy to hand wash and fully towel dry between uses. We like that this kit comes with a whopping 20 discs that make a variety of fun cookie shapes and creates perfect churros and cheese straws you can bake or fry up! It also has 8 decorating tips you can use with your favorite frosting recipe to decorate cookies, cupcakes, cakes, and more! You can whip up a pretty nice spread of cakes, cookies, and snacks with one tool, which saves you both money and precious storage space in your kitchen! What is the best cookie press the whole family can use to make their favorite cookie shapes? This cookie press from Kuhn is great because it’s easy to use – even for kids! We recommend this cookie press for families because you can press cookies with just one hand, making it easy to use – even for kids! The clear barrel allows you to see how much dough you have left, so you can easily refill when it’s time. Oh, and the press is dishwasher safe, so cleanup is a breeze! The kit comes with 14 different discs that are great to use year-round, so you can make wreaths and trees for the winter holidays, flowers and hearts for spring, and even pumpkins and bats in the fall! There’s even a disc to make consistently sized churros and cheese straws! This would make a great gift idea for kids who want to get in the kitchen and start learning how to bake! Last up in our best cookie press reviews is this set of plastic discs and cookie press from Nordic Ware, a trusted brand in cookware since 1946! We like that everything included in this set is made of durable plastic, which means you don’t have to worry about rust! Everything is easy to clean and air dry between uses, so you can get on to decorating your cookies quickly! This set comes with 12 discs in fun shapes that are sharp and robust, so you can use it with your favorite spritz dough recipe and feel good they’ll come out crisp and clean every time. You can use this to make sweet cookies or create savory dough to make cheesy or herb crackers! The Nordic Ware website has recipes for a sweet and savory dough to get you started! This is a great cookie press that’s easy for the whole family to use, easy to clean, and built to last!